Mauboussin will follow last year's Mauboussin Pour Elle with Mauboussin Rose, a new 'sparkling and fresh' fruity floral for women, in January. Mauboussin Rose was developed by perfumers Benoist Lapouza and Delphine Lebeau; notes include cassis bud, bergamot, mandarin, apple, pear, caramel, magnolia, jasmine, rose, raspberry, cedar and sandalwood. Mauboussin Rose will be available in 30, 50 and 100 ml Eau de Parfum and in matching body products. the bottle looks nice, but on the other hand, don’t you think it might be a little difficult to hold it in one’s hand? 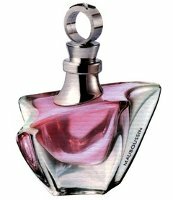 The bottle for the original Mauboussin fragrance is tricky too – and impossible to decant from without perfume going everywhere. Love that bottle. This is why you decant with pipettes. But you can’t decant with pipettes if the spray top is crimped on, unfortunately! And it usually is. Uh, yeah. You’re right. I guess you have to decant by spraying into a vial. That does get messy. Isn’t the glass part of the bottle extremely similar to Angel’s? I thought it looked similar – as if the Angel bottle was placed in fire briefly to melt and become a bit more abstract. word. funnels. tiny funnels. Spray into funnel on vial. Really, it’s not like it takes 3 hands. Some bottles are hard to spray at all, regardless of whether or not you have a funnel — I think that was the point. anybody know where one can buy the “Mauboussin pour Elle” Fragrance? never seen it on any site or such….